Clemson Eye is proud to be among the first clinics in the United States, and the only clinic in the Upstate, to offer patients Kamra. Clemson Eye’s Medical Director and Chief Eye Surgeon, Dr. Parisi, was honored to be chosen by the manufacturer AcuFocus to be among the first 50 surgeons nationwide introducing the Kamra to patients after it received FDA approval in 2015 for use in the United States. Almost 114 million people in America struggle with presbyopia (prez-bee-OH-pee-ah). This natural age-related change reduces the eye’s ability to focus on near objects, resulting in blurry near vision, and the frustration of having to use reading glasses. Like LASIK, the Kamra inlay is an elective procedure. We offer 0% financing and payment plans. Note funds from your Flexible Spending Account or Health Savings Account (FSA/HSA) can be used to cover the cost of the procedure. If you’d like more information, fill out the self‑evaluation form below and request a free Kamra consultation with us online or call 855‑654‑2020 toll‑free. All of this happens continuously and instantly to give us clear vision from near to far distances. But, our eyes don’t always work perfectly. Their exact size and shape affect how well they focus light. These differences can cause some of us to have myopia (nearsightedness), hyperopia (farsightedness) or astigmatism (irregularly shaped cornea). Over time, we also develop presbyopia, the inability to focus on near objects. In our 40s and 50s, we begin to experience the naturally frustrating effects of blurry near vision. Reading the newspaper, seeing the computer screen or sending a text message becomes a struggle. We end up depending more and more on reading glasses or contact lenses to see up close. This natural loss of reading vision is called presbyopia, and it eventually affects all of us, even if we never needed vision correction before. 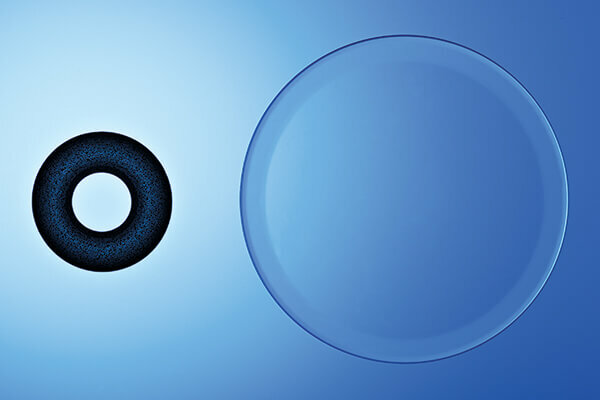 The Kamra corneal inlay is made of a proven biocompatible material called polyvinylidene fluoride, and has been tested and implanted safely in thousands of eyes. More than 1,400 have been implanted in the U.S. since FDA approval, and more than 20,000 have been implanted worldwide over the past 10 years. The inlay sits in the first few layers of the eye known as the cornea. Smaller and thinner than a contact lens, the Kamra inlay is a mini-ring with an opening – or pinhole – in the center. The inlay uses this pinhole to focus light coming into the eye. This restores near vision while maintaining distance vision. It is ideal for active people looking to no longer depend on reading glasses or contact lenses for their everyday activities. Restores everyday vision so you can see text messages, food and drug labels, a computer screen and the time on your wrist watch, without the frustration of reading glasses. Offers a long-term solution that will help you enjoy clear near vision. The Kamra is a lasting solution to presbyopia. If the patient develops cataracts or changes in their underlying prescription after the inlay, they may need an additional treatment, such as LASIK or cataract surgery. But these procedures can be performed while the inlay remains in place. Even patients who have had previous eye surgery or wear bifocals can be candidates for a corneal inlay. We can confirm their candidacy at a complimentary consultation in our clinics. From start to finish, the Kamra inlay procedure will typically take less than 20 minutes. Numbing drops are used to ensure you are comfortable throughout the procedure. You may feel slight pressure while the doctor uses a laser to create a small opening in the first few layers of your eye, known as the cornea. However, it only lasts a few seconds. The inlay is then placed within the opening. Once the numbing drops wear off, your eyes may feel irritated or scratchy, and you may also experience excessive tearing or light sensitivity. This is normal. Your doctor will provide medications to help you manage these symptoms. To learn more, watch this short video of an animation of the procedure. As with any eye surgery, healing is a process. Adhering to your doctor’s recovery instructions will accelerate your progress. Most patients resume normal activities and return to work within 24‑48 hours. It is important to remember that the amount and pace of near vision improvement varies by individual. While some patients see an improvement within the first week to a month, others may require additional time to heal and adjust to their new vision. Avoid using your reading glasses. Take your medications as prescribed by your doctor, including artificial tears. Keep your follow-up appointments with your doctor. It is typical to experience some fluctuations in your vision in the first three to six months after surgery. This is often a sign of dry eye or your brain adapting to the new vision. These will likely stabilize. The keys to success are to be patient with the recovery process and diligent in following your doctor’s instructions. Keep in mind, some Kamra patients may occasionally require reading glasses for activities such as reading tiny print or reading in low light. If for any reason the patient is unsatisfied with the inlay, it can be removed and vision restored to its pre-inlay state. The incidence of removals has been extremely low. Find out if you are a suitable candidate by answering a few brief questions below.